Stone Sour - Shake it! Des Moines, Iowa is just barely listed in the top 100 of major American cities; the city houses - how boring - especially insurance companies. And rock band Stone Sour of course. 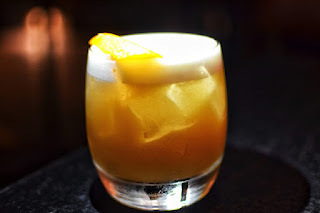 A Stone Sour is a cocktail very similar to the Apricot Sour, but with orange juice added as a bonus. The recipe: take three equal parts apricot brandy, orange juice and Sour Mix (a mixture of lime juice and lemonade syrup) and then: shake it guys!